Model: The locomotive comes with an mfx digital decoder and extensive sound functions. It has controlled high-efficiency propulsion with a flywheel, centrally mounted. All 4 axles powered through cardan shafts. Traction tires. The triple headlights and dual red marker lights change over with the direction of travel, will work in conventional operation, and can be controlled digitally. The headlights are maintenance-free warm white LEDs. The locomotive has separately applied grab irons on the sides and ends. It also has detailed buffer beams. Brake hoses are included that can be installed on the locomotive. Length over the buffers 18.4 cm / 7-1/4. New tooling for the V 160 Lollo pre-production locomotive. 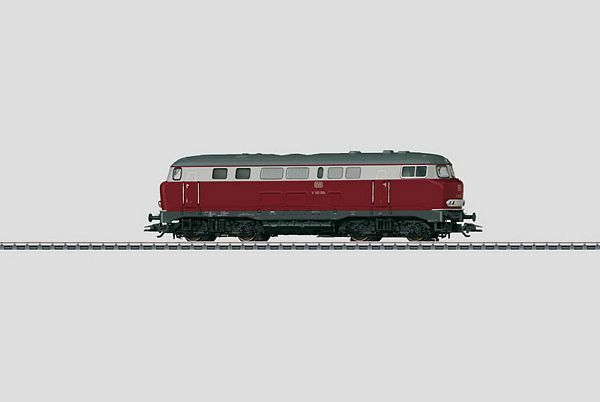 Bi-level cars for service between Hamburg and Bremen go well with this locomotive and are also being offered under item number 43597 only for the Exclusiv program in the Marklin new items assortment.